Today’s announcement of a large scale PSNI operation against individuals that are alleged to be involved in the ‘North Belfast UVF’ comes as the Red Hand Commando made an application to be de-proscribed. This application will, of course, be a matter primarily for the Northern Ireland Office and the Secretary of State, not the Home Office. Regardless of the varying opinions across society in Northern Ireland in relation to the Red Hand Commando application, it is somewhat of a coincidence that the PSNI chose to raid homes and properties- seemingly with remarkably accurate intelligence- on the very day of this application. This has presumably been what the PSNI describe as an ‘intelligence led’ operation. It is somewhat fortuitous that this intelligence just fell into the PSNI’s lap on such a politically convenient day. You would have to ask whether the PSNI have sat on this intelligence and decided to act only when it was politically convenient. A number of the items displayed by the PSNI- just in time for the evening news cycle- are commemorative materials unrelated to the contemporary UVF, others are conflict related memorabilia. Are the PSNI now intending to pursue membership charges under the terrorism act against any individual that collects conflict related memorabilia? If they are to do so then when will they be raiding republican ex-prisoners centres that are littered with paraphernalia related to the conflict? 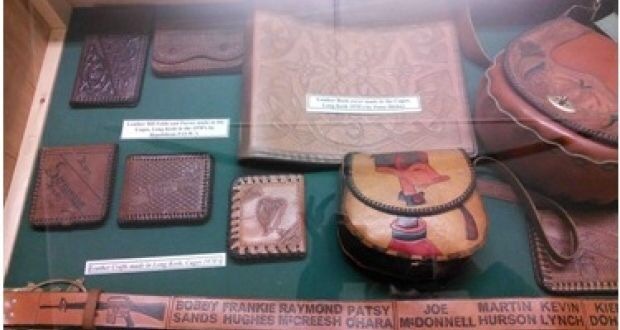 To follow the logic of linking some of the items the PSNI have paraded today to terrorism, then a leather wallet or painting from Long Kesh- if we are using the PSNI’s apparently broad definition- could be used as proof of support for a proscribed organisation. There is of course an increasing narrative that justifies the IRA’s campaign and ‘normalises’ their actions as legitimate. On the opposite side of the scale there is a relentless campaign to demonise loyalists. In ‘peace process’ speak loyalists were nothing more than British state run ‘death squads’ whilst the IRA were freedom fighters. Loyalists murdered people, the IRA killed people as part of their ‘struggle’. Events commemorating loyalist combatants are glorifying bloodthirsty murderers, whilst children’s play parks named after IRA terrorists are simply remembering the republican freedom fighters and their struggle for ‘equality’. Loyalist culture is dismissed as regressive anti-social behaviour, whilst a St Patrick’s day tri-colour waving booze filled rampage or the West Belfast festival chanting of IRA songs is held up as a great celebration of Irish culture. Drugs in a Unionist area is ‘loyalist criminality’, drugs in a republican area is simply ‘crime’. If the PSNI suspect crime then they should absolutely do their job, but they must do the same job across the board. There can not be one interpretation of the law for loyalism and one for republicanism. 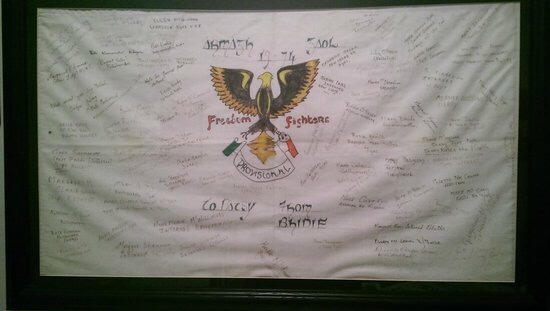 Today’s parading of seized UVF memorabilia, some of which is no different than museums on the Falls Road littered with IRA material, will further reinforce the belief that not only is the political process tilted in favour of republicans, but that the policing and justice apparatus is disproportionally directed against the loyalist community. 187 Responses to "Opinion: PSNI ‘seizure’ of UVF memorabilia is convenient politicking "
My partner and I stumbled over here by a different web address and thought I may as well check things out. I like what I see so i am just following you. Look forward to exploring your web page repeatedly. naturally like your website but you need to check the spelling on quite a few of your posts. A number of them are rife with spelling issues and I find it very bothersome to tell the truth nevertheless I’ll definitely come back again. Nice post. I was checking constantly this blog and I’m impressed! Extremely useful information specially the last part 🙂 I care for such information a lot. I was seeking this certain info for a long time. Thank you and good luck. hello there and thank you for your info ? I have certainly picked up something new from right here. I did however expertise a few technical issues using this site, since I experienced to reload the site lots of times previous to I could get it to load correctly. I had been wondering if your web hosting is OK? Not that I’m complaining, but slow loading instances times will sometimes affect your placement in google and could damage your quality score if advertising and marketing with Adwords. Anyway I?m adding this RSS to my e-mail and could look out for much more of your respective exciting content. Ensure that you update this again soon.. I just couldn’t go away your website prior to suggesting that I actually enjoyed the usual information an individual supply to your guests? The very core of your writing whilst sounding reasonable at first, did not really work very well with me personally after some time. Somewhere throughout the sentences you actually were able to make me a believer unfortunately only for a while. I still have a problem with your leaps in assumptions and you would do well to help fill in those gaps. In the event that you actually can accomplish that, I would definitely end up being fascinated. I’m impressed, I have to say. Really hardly ever do I encounter a weblog that’s each educative and entertaining, and let me inform you, you could have hit the nail on the head. Your concept is excellent; the issue is one thing that not sufficient individuals are talking intelligently about. I am very happy that I stumbled across this in my seek for something referring to this. whoah this weblog is magnificent i like reading your posts. Keep up the good work! You know, lots of people are searching around for this information, you could aid them greatly. Hello there I am so excited I found your blog, I really found you by accident, while I was looking on Bing for something else, Anyhow I am here now and would just like to say cheers for a tremendous post and a all round enjoyable blog (I also love the theme/design), I don’t have time to browse it all at the moment but I have bookmarked it and also added your RSS feeds, so when I have time I will be back to read a great deal more, Please do keep up the superb job. It’s the best time to make some plans for the long run and it is time to be happy. I’ve learn this post and if I may just I want to recommend you some interesting things or suggestions. Maybe you could write subsequent articles relating to this article. I wish to learn even more things approximately it! This is very interesting, You’re an excessively skilled blogger. I’ve joined your rss feed and sit up for in the hunt for more of your fantastic post. Additionally, I’ve shared your site in my social networks! Howdy very nice site!! Guy .. Excellent .. Superb .. I’ll bookmark your website and take the feeds additionally…I am happy to seek out so many useful info here within the put up, we’d like work out extra techniques in this regard, thanks for sharing. . . . . .
Thankfulness to my father who shared with me regarding this weblog, this web site is in fact remarkable. I’m not positive the place you are getting your information, but good topic. I must spend some time finding out much more or understanding more. Thanks for magnificent info I was in search of this info for my mission. I like the helpful information you provide in your articles. I?ll bookmark your blog and check again here frequently. I am quite sure I will learn many new stuff right here! Good luck for the next! The very core of your writing while sounding agreeable in the beginning, did not settle perfectly with me after some time. Somewhere within the paragraphs you actually managed to make me a believer but only for a while. I still have got a problem with your leaps in assumptions and you might do nicely to fill in all those breaks. If you can accomplish that, I will surely end up being impressed. I do like the manner in which you have framed this particular issue and it does indeed give us some fodder for consideration. However, because of what precisely I have seen, I really trust when other responses stack on that people remain on issue and in no way get started on a soap box associated with some other news of the day. Anyway, thank you for this excellent point and although I do not go along with the idea in totality, I value the standpoint. seem to be fascinated unless it is one thing to do with Girl gaga! someone with some genuine thoughts on this subject matter. Really.. thank you for starting this up. This web site is one thing that is required on the internet, someone with a little originality! Heya terrific website! Does running a blog such as this take a large amount of work? Мы готовы предоставить качественные услуги прокси-серверов пакетами. Вам нужен стабильный частный прокси для работы в Instagram, Вконтакте,Однокласниках или Авито? Вы увлекаетесь букмекерскими ставками или покером? SEO,SMM, просто безопасный серфинг либо другие темы? В том случае вы по нужному адресу. Мы готовы предоставить анонимные, элитные, прокси-сервера с качественной круглосуточной поддержкой. Все наши прокси могут применяться для различных программ,сервисов, социальных сетей, онлайн игр и не только. Авторизация по логин – паролю или IP адресу. Быстрые прокси ipv4 и ipv6 (до 100 мбит/с) обеспечат стабильную работу. Нужны различные подсети, у нас их достаточно. Так же вы имеете возможность выбрать тип протокола HTTP/SOCKS. Мы представляем высококачественные услуги прокси-серверов пакетами. Вам требуется стабильный личный прокси для работы в Instagram, Вконтакте,Однокласниках или Авито? Вы интересуетесь букмекерскими ставками или покером? SEO,SMM, просто безопасный серфинг либо другие задачи? В таком случае вы по адресу. Мы предлагаем анонимные, элитные, прокси-сервера с надежной круглосуточной поддержкой. Наши прокси могут применяться для любых программ,сервисов, социальных сетей, онлайн игр и не только. Авторизация по логин – паролю или IP адресу. Стремительные прокси ipv4 и ipv6 (до 100 мбит/с) гарантируют стабильную работу. Требуются разные подсети, у нас их много. Так же вы сможете выбрать тип протокола HTTP/SOCKS. Audio started playing anytime I opened up this site, so irritating! hey there and thanks on your information – I have definitely picked up anything new from proper here. I did then again experience some technical issues using this site, as I experienced to reload the website a lot of times previous to I may get it to load correctly. I were considering if your web host is OK? No longer that I’m complaining, however sluggish loading cases times will sometimes affect your placement in google and could damage your high-quality score if ads and ***********|advertising|advertising|advertising and *********** with Adwords. Well I’m adding this RSS to my email and could glance out for much more of your respective intriguing content. Ensure that you replace this again soon.. The following time I read a blog, I hope that it doesnt disappoint me as much as this one. I imply, I know it was my choice to read, but I truly thought youd have something fascinating to say. All I hear is a bunch of whining about one thing that you may repair should you werent too busy on the lookout for attention. fantastic issues altogether, you simply received a emblem new reader. What could you suggest in regards to your publish that you simply made a few days in the past? Any positive? With havin so much content do you ever run into any issues of plagorism or copyright infringement? My site has a lot of completely unique content I’ve either authored myself or outsourced but it appears a lot of it is popping it up all over the internet without my authorization. Do you know any methods to help reduce content from being ripped off? I’d truly appreciate it. Its such as you learn my mind! You appear to know a lot about this, such as you wrote the ebook in it or something. I believe that you can do with a few to power the message home a bit, but instead of that, that is fantastic blog. An excellent read. I will certainly be back. Useful info. Lucky me I found your website unintentionally, and I’m shocked why this coincidence did not took place earlier! I bookmarked it. Simply wish to say your article is as astounding. The clearness in your post is simply nice and i can assume you are an expert on this subject. Well with your permission let me to grab your RSS feed to keep up to date with forthcoming post. Thanks a million and please carry on the enjoyable work. you are in point of fact a just right webmaster. The site loading speed is amazing. It kind of feels that you’re doing any distinctive trick. Also, The contents are masterwork. you have performed a fantastic activity in this subject! Great blog! Do you have any helpful hints for aspiring writers? I’m hoping to start my own blog soon but I’m a little lost on everything. Would you recommend starting with a free platform like WordPress or go for a paid option? There are so many choices out there that I’m totally overwhelmed .. Any ideas? Appreciate it! Hiya, I’m really glad I’ve found this info. Today bloggers publish only about gossips and net and this is actually irritating. A good site with exciting content, that’s what I need. Thanks for keeping this website, I will be visiting it. Do you do newsletters? Can not find it. Throughout this great design of things you get an A for effort. Where exactly you confused us was in all the particulars. You know, it is said, the devil is in the details… And that couldn’t be more correct here. Having said that, permit me say to you just what exactly did do the job. Your text is certainly really engaging which is most likely the reason why I am making the effort in order to opine. I do not make it a regular habit of doing that. 2nd, although I can easily see a jumps in reasoning you come up with, I am not really sure of just how you appear to connect the details which in turn help to make the final result. For the moment I will yield to your point but wish in the future you connect your facts much better. Can I simply say what a reduction to search out someone who actually is aware of what theyre talking about on the internet. You undoubtedly know the way to convey a difficulty to light and make it important. More folks must read this and understand this side of the story. I cant consider youre not more widespread since you positively have the gift. I wish to voice my affection for your generosity supporting all those that absolutely need help on this theme. Your personal commitment to passing the message all-around had become definitely good and has consistently enabled many people like me to achieve their endeavors. Your own invaluable advice signifies a whole lot to me and still more to my fellow workers. Warm regards; from each one of us. Hey There. I discovered your weblog the use of msn. This is a really well written article. I’ll make sure to bookmark it and come back to read extra of your helpful information. Thank you for the post. I’ll definitely comeback. it and also added your RSS feeds, so when I have time I will be back to read more, Please do keep up the fantastic b.
hey there and thank you for your information – I have definitely picked up something new from right here. I did however expertise some technical points using this site, since I experienced to reload the website a lot of times previous to I could get it to load correctly. I had been wondering if your hosting is OK? Not that I’m complaining, but sluggish loading instances times will often affect your placement in google and could damage your quality score if ads and marketing with Adwords. Well I’m adding this RSS to my e-mail and can look out for a lot more of your respective fascinating content. Make sure you update this again soon..
Hi there to all, how is the whole thing, I think every one is getting more from this site, and your views are pleasant for new visitors. is convenient politicking | Unionist Voice <Loved it! you the usage of? Can I get your affiliate hyperlink on your host? and on world-wide-web I found this web page as a best web page for hottest updates. Greetings! Very useful advice within this post! It’s the little changes that make the biggest changes. Many thanks for sharing! It’s in reality a great and useful piece of info. I am glad that you just shared this helpful information with us.